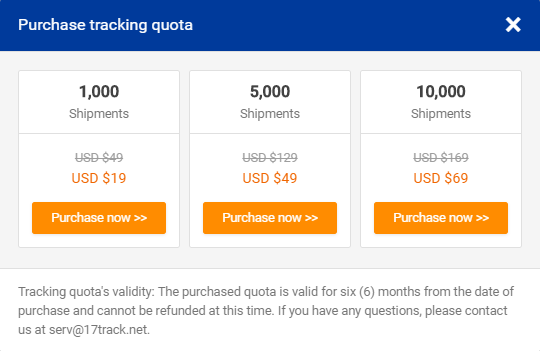 Tracking quota is the number of shipments you can track in your account. Each valid tracking (carrier of the tracking number can be detected) will consume the tracking quota. Currently, when you first sign up an account of seller role in 17TRACK, you will have 100 free tracking quota by default. Moreover, once a shop with valid orders is bound with a 17TRACK seller account, 2000 more free tracking quota will be given, and altogether 6100 tracking quota will be given at most for each seller account month by month. Note: The tracking quota is given at the beginning of each month, and is also cleared at the end of each month. The tracking quota is consumed as long as it is used. Email quota is the number of emails you can send to your customers in your account. Each sucessfully sent email will consume the email quota. Currently, when you first sign up an account of seller role in 17TRACK, you will have 1000 free email quota by default. The validity period of the email quota will be three months. If you are running out of your email quota later, you can purchase more according to your needs to continue sending emails to your customers. Your support is of vital importance to 17TRACK! With your support, we believe we can keep improving our functions and user experience! If you have any questions or feedback, feel free to contact us at serv@17track.net! What marketplaces and platforms are supported?